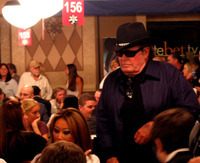 James Garner gave the official "Shuffle up and deal!" yesterday. The legendary actor also played in the media tourney the day before. The two things that people were talking about the most was the fact that the spectators were not allowed in the Amazon room, and that there was a nun playing with a growing stack in front of her. I don't recognize any of the top ten finishers of Day 1A, but they all deserve a big pat on the back for their efforts.